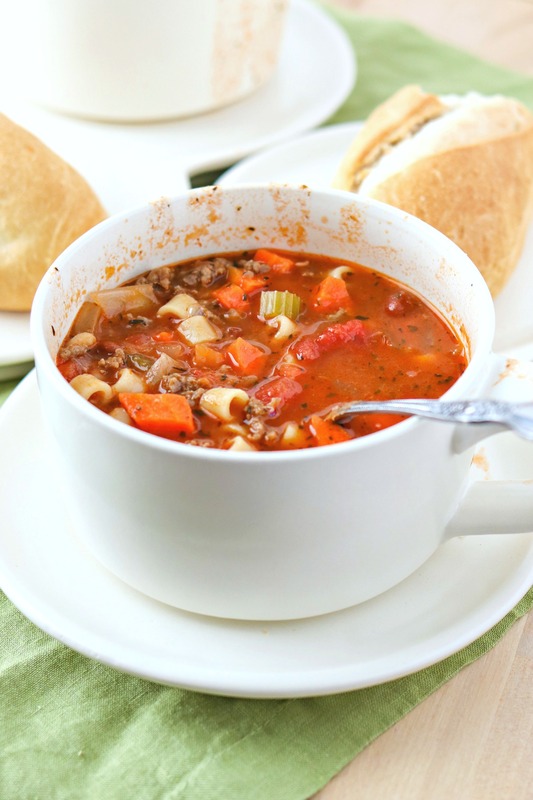 Pasta e Fagioli Soup – A classic Italian soup that is made with a tomato broth, ground beef, pasta, and packed-full of veggies and beans. All of these ingredients transform this into an irresistible dish that is so comforting and warms the heart. And stomach! Even better than the Olive Garden version. This winter has felt unusually warm here in Atlanta. If we get cold weather, it’s in short bursts, maybe a week max. Now, I think it’s starting to slowly dwindle away. Our cold-weather bursts only last about a day and then it’s back to 70-degree highs. So crazy. Regardless of the weird weather, I’ve been enjoying various comforting homemade soups like this turkey noodle soup and this hearty chili. Before the cold weather gets completely away from us, I need to share another one of my favorite soup recipes: pasta e fagioli. Some of you may be familiar with this soup because you’ve had it at Olive Garden. If so, then you’re in luck – this soup tastes EXACTLY like that version, except with the freshness that comes with it being homemade. Plus, now, you can enjoy it any time you want! If you’ve never had pasta e fagioli, I like to describe it as an Italian chili, only much healthier. It’s made with a tomato broth and has tons of veggies and beans, and some pasta and ground beef. Oh and a great mix of Italian herbs. This soup is my new favorite! It has all the comfort and heartiness of a chili but the nutrition of a noodle soup. Unlike a chili, I can eat it without any toppings, and unlike a noodle soup, I don’t need any bread to dip into this soup. That means less calories, people! This soup is so unbelievably irresistible. Taking these pictures was so hard because I couldn’t stop eating the soup! When I had the chance to sit down and have a bowl in peace, I couldn’t eat it fast enough. I literally licked the bowl clean. And then served myself again! When it comes to making this soup, it’s just as easy to make as a chili. But you don’t need to cook for as long. I was shocked at how easily the flavors came together without cooking for hours and hours. It only took about 45 mins from start to finish. So easy! When dicing the veggies, make sure they’re all the same size. This will make sure they cook evenly. The pasta doesn’t freeze well because it turns mushy when you reheat it. So if you’re going to freeze a portion of this soup, don’t add the pasta to that portion. Instead, add the pasta when you reheat it. Speaking of pasta, you can easily substitute the ditalini for mini shells, like they use at Olive Garden. I like the look of the ditalini so that’s what I used here. If you want more Italian flavor in this soup, you can substitute the 1 pound of lean ground beef with 1 pound of Italian sausage. I don’t like the fennel that’s in Italian sausage so I didn’t even consider using it. But there are a few recipes for this classic soup that swear by it so give it a try if it sounds like you’re thing! That’s all there is to it! You’re really gonna love this soup. Hurry up and make it before it gets too hot to move. A classic Italian soup that is made with a tomato broth, ground beef, pasta, and packed-full of veggies and beans. All of these ingredients transform this into an irresistible dish that is so comforting and warms the heart. And stomach! Even better than the Olive Garden version. Bring a medium pot of water to boil. Add pasta and stir. Cook as directed on the box, although I do not think it's necessary to salt the water since the soup will be well-seasoned. When done, drain the pasta and set aside until we finish the soup. In a large pot set to medium heat, add 1 tablespoon of olive oil and the lean ground meat. Cook until browned, about 4 minutes. Drain the fat and set meat aside. Place pot back on the burner and turn heat to medium. Add remaining tablespoon of olive oil. Add garlic to cook a little until fragrant, about 1 minute. Add remaining vegetables (onion, carrot, celery) and cook until it begins to get tender, about 8-10 minutes. Add in chicken broth, tomato sauce, diced tomatoes, spices, cooked meat, and 1 cup of water. Stir together to combine. Bring to a boil and then lower to a simmer and cover. Cook for 10-15 minutes, or until vegetables are tender (not crunchy). Stir in pasta and beans. Cook until heated through. Give it a taste. Add salt and pepper, as necessary. Serve immediately with a sprinkle of fresh parsley or grated Parmesan. If you plan to freeze some of this, only add pasta to the portions that you will eat immediately. It will get too mushy when frozen and then thawed. Just made a pot of this today for dinner tonight. It came out great! Quick and easy, hearty, and will definitely make again! Yay! So glad you loved it! It’s one of my all-time favorite soups. Thanks for stopping by to tell me how it went! a big pot of this soup! OHHHHH, yum. This looks so comforting and cozy and warm. I want to make this with ground turkey!! Yumm! This looks perfect for a cold day! I would have probably had 3 bowls too! It looks fantastic! I love a good soup in the winter!! This looks really hearty and delicious, I can’t wait to try it!! This soup looks really hearty and filling. I worked at Olive Garden for over two years in college, and you’ve done a great job at a copycat recipe. It looks identical. Wow what a compliment! Thanks Kimberly! This is absolutely mouthwatering. I cannot wait to try it. Thanks for sharing. This soup definitely brings back memories of my childhood! It’s been so cold here I think I need to make this soup for dinner tonight. Thanks for the memories! Yay! It’s perfect for weeknights since it’s so quick. I hope it helps warm you up! Our good friend made this soup saturday. It was the first time we had ever had it and my husband fell in love. This is going in the recipe box. Aw yay! I hope you like this version too! Yum! You can tell it’s lunchtime when I’m about to reach through the computer to grab a bowl of soup. This looks so yummy I pinned it! We don soup every Saturday for a few more weeks! Yum! This is one of my favorite things to get at Olivie Garden!